November 9, 2011 - Aviation fans are fond of recalling great milestones in the industry. December 17, 1903: the Wright brothers took off from Kitty Hawk, North Carolina. May 21, 1927: Charles Lindbergh landed in Paris, completing the first transatlantic flight. October 14, 1947: Chuck Yeager officially broke the sound barrier. As aviation technology has improved, history continues to be made in the air. On Monday a major milestone in aviation fuel efficiency was made when United Airlines flew the first ever commercial domestic flight using a blend of biofuel and traditional jet fuel. In addition, United announced its intent to purchase 20 million gallons of bio-fuel per year, giving this young, green industry a big boost. United Airlines Flight 1403, departed Houston Monday morning at 10:30 am local time, bound for Chicago making it the first commercial passenger flight with a 40% biofuel mix created from algae by Solazyme, a San Francisco based company. The flight's success demonstrated that, as United?s Executive Vice President, Pete McDonald, said, ?Sustainable biofuels, produced on a large scale at an economically viable price, can one day play a meaningful role in powering everyone's trip on an airline." 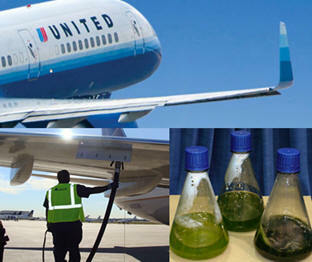 United is not the only commercial airline making biofuel history this week. Alaska Air has two flights scheduled from Seattle scheduled today, one to Washington, DC, and one to Portland, Oregon burning a 20% biofuel blend that uses cooking oil. As Alaska Air Group Chairman and chief executive Bill Ayer put it, ?This is a historic week for US aviation.? This is a win for the American people, our environment, and the great partners in the Commercial Aviation Alternative Fuels Initiative (CAAFI), which has been working to find sustainable fuels for airlines since 2006. This partnership was established by the Federal Aviation Administration with government, industry and academia working together to make alternative fuels a reality for commercial air travel. Because traditional fuel prices fluctuate constantly, CAAFI has been working diligently to find efficient, cost-effective ways of powering aircraft without relying on imported foreign oil. Making aviation more environmentally friendly is also driving principal behind the FAA's NextGen air traffic modernization efforts. Monday's flight and the commitment of U.S. carriers to alternative fuels demonstrate that the FAA and DOT are on their way in meeting their goals. US Secretary of Transportation, Ray LaHood said ?I want to salute the carriers who are pressing forward with alternative fuels, the people working on a greener airspace at FAA, and all of our partners in the CAAFI. In September, the U.S. Defense Logistics agency announced the first department of Defense contract for purchase of Alcohol to Jet (ATJ) fuel. Advanced biofuel producer Gevo will supply the United States Air Force with 7,000 gallons of fuel. The fuel was shipped to Wright-Patterson Air Force Base, where the Air Force has been lab testing and engine testing. The ATJ fuel is scheduled to be produced from isobutanol. The company plans to begin shipping product to the USAF in the first quarter of 2012. The planned USAF testing will advance progress towards eventual approval of a third alternative jet fuel pathway.